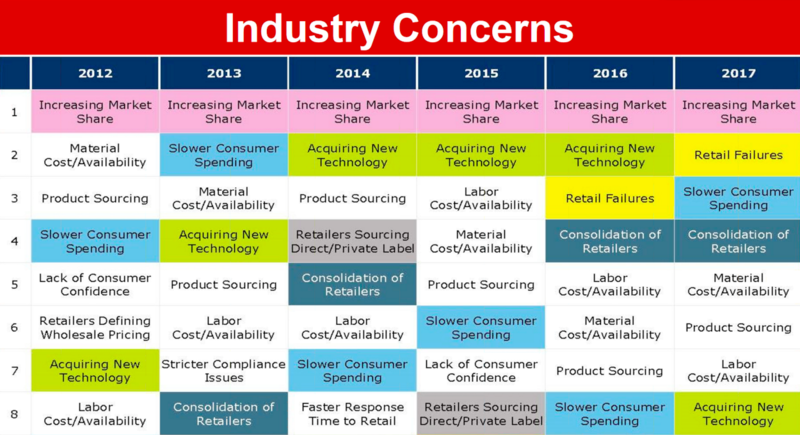 On a webinar last week providing an update on the state of the sporting goods industry, Tom Cove, SFIA’s president and CEO, said that many of the industry’s players appear to be fixated on protecting their market share somewhat at the expense of pursuing growth opportunities. While this reflects an industry recovering from a string of bankruptcies, he lamented that the cautious stance may be holding back the industry’s overall growth. “Many more folks are chasing a zero-sum game,” said Cove. The cautiousness is most evident in SFIA’s 2017 The State of the Industry Report that found the industry less open to spending on technology. According to an accompanying survey, only 47.7 percent of industry vendors indicated that they planned to launch a new technology within their product line in 2017. That’s well down from 59.4 percent in 2016 as well as 51.3 percent in 2015 and 57.9 percent in 2014. Cove said that for whatever reason, “folks are saying technology is not going to be my answer any more.” He added that while certain firms may have sound reasons for pulling back on their technology investments, he doesn’t see the net shift as a “good thing” given technology’s role as a catalyst for innovation. The cautiousness was also seen in SFIA’s annual ranking of the industry’s top concerns. “Acquiring New Technology” sunk to the bottom of the list of eight concerns, down from two the prior year. Other indicators that the industry may be in a more defensive mode is that “Retail Failures” ranked number two in 2017, a tick up from three in 2016 and not even landing among the top eight over the prior four years. “Slower Consumer Spending” ranked as the third concern, up from eight in 2016. The overall disruption facing the industry in recent years has been mostly marked by the bankruptcies and subsequent liquidations. But Cove also noted that the upheaval facing retail overall due to online’s increasing influence on purchases has also skewed the industry’s typical growth patterns. Cove is hopeful that the industry will be shown to have gotten back on track when figures arrive for 2018 because underlying fundamentals remains strong. Increased wages and high consumer confidence are expected to support healthy gains in the overall GDP. The industry is still well positioned to benefit from the health & fitness trend and the fact that keeping fit is one way to offset rising health care costs. He also said Americans “love sports” in general. Cove also showed a chart of a number of newer companies that have brought innovation to the marketplace. The list included Lululemon, Fitbit, Sträva, Carbon38, Allbirds, Aaptiv, Mindbody, CorePower Yoga and Outdoor Voices. Still, Cove spent a large part of presentation emphasizing risks around sports participation to the industry’s growth. On the plus side, participation (6 to 17 year olds) has seen an improving trend in recent years with only a few activities seeing declines (track & field, fast-pitch softball, tackle football and outdoor soccer) from 2012 to 2017. 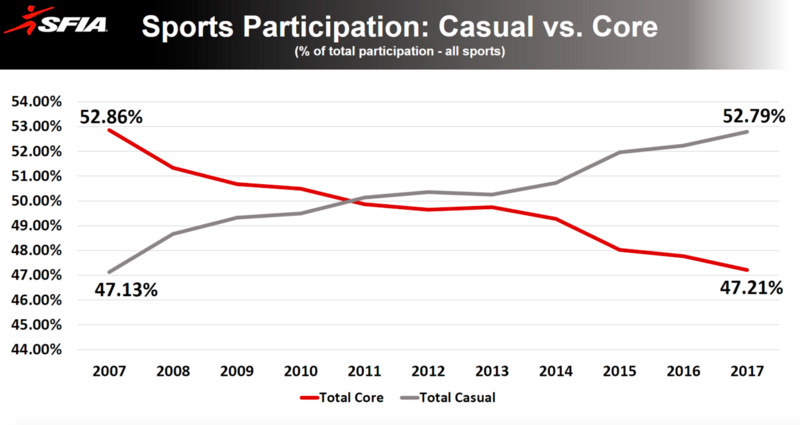 But the gains have been driven by casual rather than core participants. Except for running/jogging and weight/resistance, core participation is down or flat across most activities. 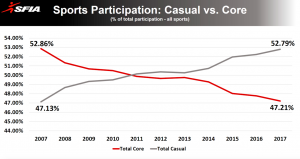 Core participants, or those regularly participating in an activity, generally spend significantly more on sporting goods and are more likely to stick with the activity versus casual participants. Moreover, he pointed to a study showing that 60 percent of those wearing activewear (running shoes, yoga pants, sweatshirts) at least several times a month almost never exercise, underscoring the high risks should the athleisure trend fade. 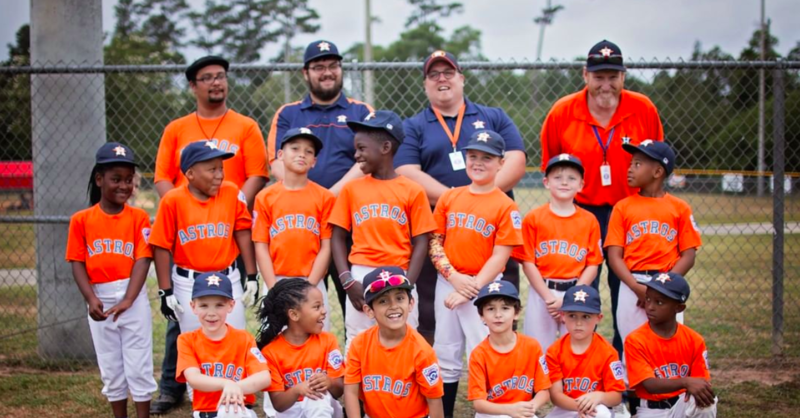 Safety concerns and costs continue to be major barriers to youth sports growth and Cove said the industry has opportunities to take the lead in coming up with solutions. Cove discussed the importance of supporting the PHIT Act, which would provide tax breaks for gym memberships, acquiring fitness equipment like a treadmill, or signup costs to join a recreational sports league. In July, the decade-old legislation was passed by the U.S. House of Representatives for the first time and has advanced to the U.S. Senate. Cove said the bill could be a big step toward addressing the Inactivity Pandemic that’s impacting the health of Americans and the industry. SFIA’s 2017 The State of the Industry Report showed 27.6 percent of Americans were inactive. Studies show an inactive person spends $200 per year on sporting goods versus $900 on average spend per year for an active individual. Tariffs: President Trump announced tariffs on $250 million on Chinese imports, covering more than 5,000 products. A 10 percent tariff arrived in September and that was expected to increase to 25 percent at the start of the new year. The Trump administration this past weekend announced a 90-day tariff suspension period for the tariff increase as negotiations continue. Cove said hats, bags, glove & fitness components were all impacted with the $250 million round. Another round of tariffs, as has been threatened by the Trump administration, would impact a broader range of sporting goods, including sports & fitness equipment, footwear and apparel. Cove said the smaller the company the more challenges being faced finding alternative sourcing. DTC: SFIA estimates that much of the $3.5 billion in revenues that left the marketplace from the exit of Sports Authority as well as $1 billion from other bankruptcies in recent years has gone to direct-to-consumer channels. New concepts such as pop-up shops, subscription models, curated packages as well as private label expansion and enhanced customization capabilities are all presenting challenges and opportunities for the industry.